Affectionately known as the Pearl of the Adriatic with its temperate climate and beautiful location standing sentinel over the Mediterranean, Dubrovnik has weathered many storms over the centuries. Although it was heavily bombed during the Croatian War of Independence from 1991 to 1995, most of the damage has been repaired. Look closely though and you may be able to spot bullet marks and mortar damage around the old town. Thankfully, Dubrovnik survived the latest onslaught and holidaymakers from around the world are now finding it an excellent starting point for exploring the southern Adriatic Coast by water. Dubrovnik is also now gaining notoriety with fans of the fantasy drama television series Game of Thrones, with many visiting to see the locations used in the old city. Hidden up one of the side streets that fan out from the main street in the old town, you will find Lucin Kantun. Serving delicious rustic fare from their kitchen located in the middle of the restaurant, you can watch your meal being prepared by the chef. The dishes are not overly spicy, but are very tasty and made from fresh ingredients – notably the baked octopus and stuffed squid. After eating your fill at Lucin Kantun, head a couple of streets over to Dolce Vita for dessert – you can’t go past the chocolate and cherry crepe. Located at Nalješkoviceva ulica 1A, it is the best ice creamery in the whole of Dubrovnik (if not Croatia!). Dubrovnik is the most expensive city in Croatia for accommodation, and there is not a lot available in the old town. A reasonable option is to rent an apartment or room on AirBnB. For under AUD100, the Dubrovnik Unique Apartments A2 are located close to the Old City at Sumetska ulica 5. The host, Stjepo Pandzic is very obliging and will happily collect you from the bus station (at no charge) or from the airport for a small fee – I arrived at the central bus station at 2am and he was there to greet me! As with most of the city, you will need to climb some stairs to reach your accommodation, but this is all part of the experience! 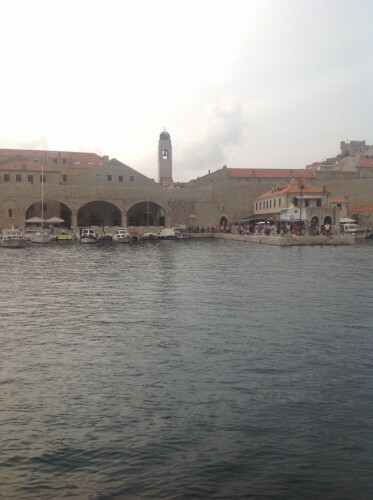 If you see nothing else whilst visiting Dubrovnik, you should not miss the Old City. Listed as a UNESCO World Heritage Site since 1979, the two-kilometre long city walls offer great views. A word of warning though – on any given day there could be as many as five or six cruise ships arriving with up to 2000 passengers on each ship. So it’s best to skip the buffet, take a packed breakfast and head to the walled city early. For only 100 kunas (AUD$20) you will have the place pretty much to yourself to enjoy the vistas, take some stunning photographs, and enjoy a coffee at one of the cafés located within the Old City. You can then head up to Mount Srd on the cable car for fantastic views over the city from the fortress, which also contains a small museum documenting its history. If you want to avoid the maddening crowds, catch the number 10 bus to the pretty seaside town of Cavtat, just 15 kilometres south of Dubrovnik. Many wealthy Croatians built mansions there last century and since the siege of Dubrovnik back in the nineties it has begun to attract more tourists. With its palm-lined promenade and ideal setting between two bays, life is much slower and more pleasurable in Cavtat. Spend the afternoon meandering along the promenade, stop for ice cream, browse through the shops and galleries before heading back to Dubrovnik on the ferry. Less than an hour later you will be dropped back at the entrance to the old town. 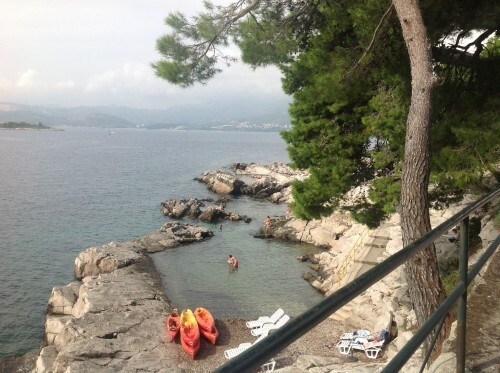 Head to one of the bars set on the outside of the city walls overlooking the sea kayakers paddling through the waters below, where you can watch the sun set while enjoying a cold drink.